Atcheson Laughlin Hench came to Virginia in 1922 on a one-year appointment to teach Middle English and Chaucer while the University dickered with a well-known scholar whom they really wanted on the faculty. 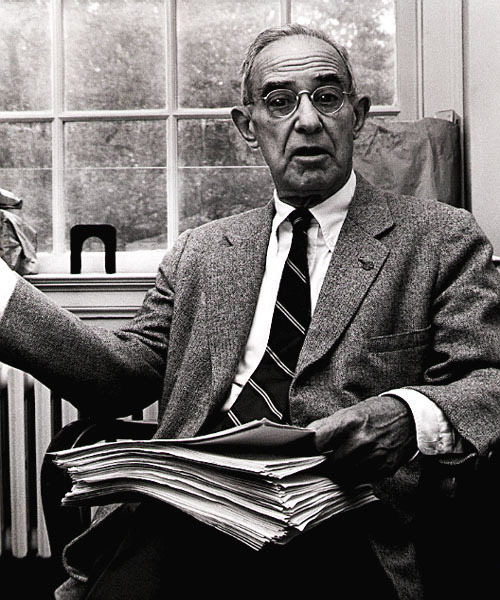 The celebrity-scholar never came and "Atch" never left--to the delight of his office mate, James Southall Wilson, who was "thankful to unload that Old English course on [Hench] and never teach Beowulf again." 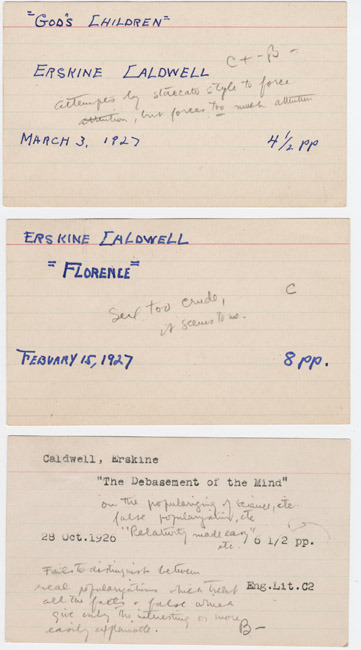 Atcheson Hench's grade cards for Erskine Caldwell, 1926-27. One of Hench's first pupils was the future best-selling author, Erskine Caldwell. Hench saved grade cards and reading lists for work completed by his students, including Caldwell. In an oral history interview given decades later, Hench was questioned about the grade "C, crude." He responded that the "crude" referred to the style, not the content, of Caldwell's work. When asked if Caldwell had ever published some of the stories he wrote for Hench, he replied, "I am sorry to say he did." Though Caldwell would never come to call his professor "Atch" as Hench asked him to, the two did become good friends. Typed letter, signed, from Erskine Caldwell to Atcheson Hench, 21 June 1931. 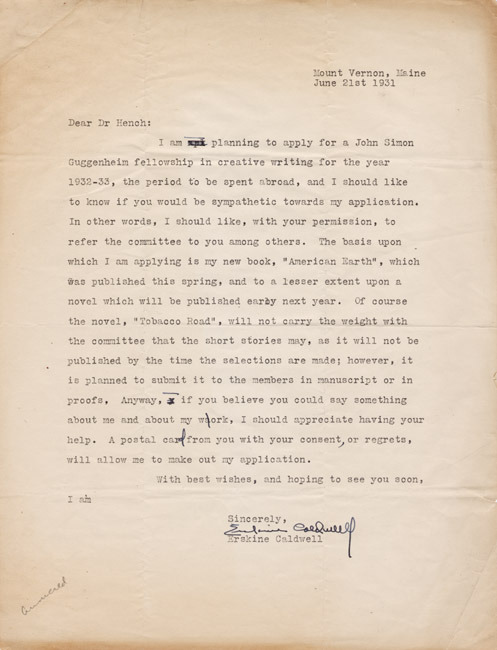 In this 1931 letter, Caldwell asks Hench to support his application for a Guggenheim fellowship the year before Tobacco Road was published.